Democrats remain favored to win, but GOP leaders believe they can minimize the number of seats they would lose  and, perhaps, find a path to preserving their advantage in the chamber. The tightening, with just over two weeks left, reflects how President Trumps rising approval rating and the polarizing fight over Supreme Court Justice Brett M. Kavanaugh appear to be boosting the partys candidates in a number of conservative and rural districts that have been considered up for grabs. The past few weeks havent really diminished Democrats chances of a takeover by that much, but theyve increased the chances of a small Democratic majority, said David Wasserman, House editor for the nonpartisan Cook Political Report. He estimated Democrats have a 70 to 75 percent chance of winning the House. At stake is the fate of the Trump presidency  whether Democrats will gain the power to investigate his administration and thwart his agenda, or if emboldened Republicans will fulfill the presidents vision for the nation, from building a border wall to repeal of the Obama-era health-care law. Enjoy this new GOP ad that truly nails the Marxist Left. Please share viral. If you read it they aren’t really saying the dems won’t take the house...so I think this was an encouragement reminder to the left to vote. Face-saving time for the Fakesters. So predictable. This evil, demented virago should be nowhere near any position of authority. Not full enough yet. If they get really scared, they start committing mass suicide. Liberals might as well face it, they’ve lost the Supreme Court. Which is a good thing. [ in solitary confinement at some remote, non descript section eight ward for the mentally ill? Nancy Pelosi can do that crazy laughter all day there. To herself. I'm sick of seeing this lie. Yes, and the NYT just put out an article how governorships may flip to Dem, which I dont think will happen, but its interesting how the bloom is off the Rose on the blue wave. ...the only change is with the pollsters trying to maintain credibility. Yeah, they've gotten all of the checks out of the check writers that they are going to get so now it's time for the truth to start creeping in. There never was any reasonable doubt. The “Blue Wave” was pure propaganda from the start. The “blue wave” was a media invention to help their Democrats in the first place. 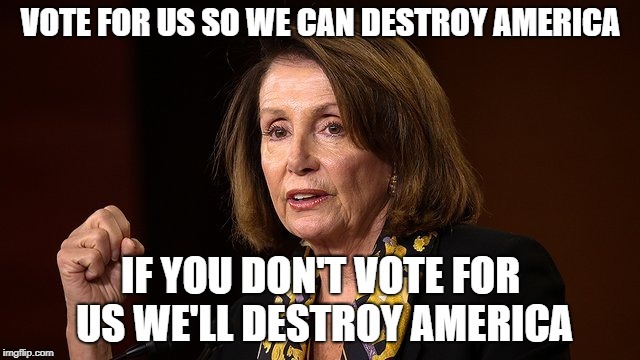 VOTE as if America depends on it - because She does! I would love nothing more than to MAGA without the ‘help’ of the Communist Democrat Party! Do you know when/where the Walk Away March is scheduled?